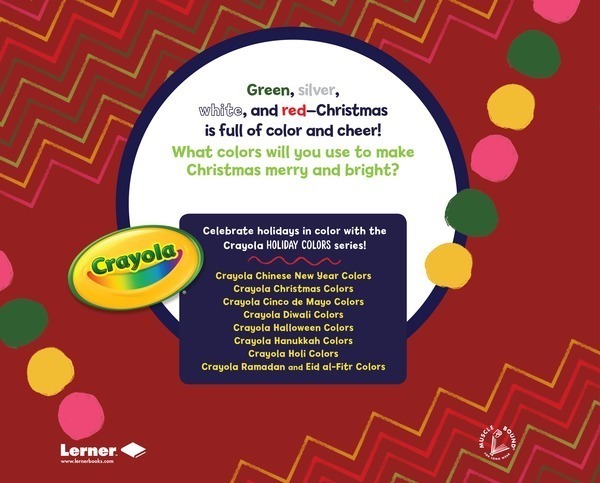 Green, silver, white, and red—Christmas is full of color and cheer! In this book, young readers discover the many colors and symbols that fill Christmas with cheer. Vibrant, colorful photos and lively text highlight the colors, symbols, and customs of Christmas. Crayola ® colors and a reproducible coloring page inspire readers to notice and celebrate the colors of their world. Mari Schuh is the author of more than 300 nonfiction books for beginning readers, covering topics from tomatoes to tornadoes. She lives with her husband in her hometown of Fairmont, Minnesota.